O Animal Mais Forte do Mundo buscou aprofundar o processo com as fotografias focando na exploração dos volumes para os movimentos e, nesse sentido, tornou-se indispensável trabalhar com um elenco. Nesta etapa do processo, Ângelo e Ana Catarina buscaram dar mais visibilidade para as danças da cultura popular que povoam a sua pesquisa de linguagem. Há uma brincadeira intencional com a cultura popular de esconde-e-aparece que está presente na trilha, na coreografia e no figurino. A obra conta com a colaboração de Juliana Augusta Vieira na iluminação e figurinos. Nela, aprofunda a sua pesquisa sobre iluminação cenográfica para dança. O Animal Mais Forte do Mundo foi a segunda etapa do processo de pesquisa com fotografias. Sua versão.2 foi apresentado no Festival Panorama. Considerado pela Folha de São Paulo um dos melhores espetáculos do ano. Com apoio do Programa Municipal de Fomento à Dança, sua pesquisa recebeu Prêmio Klauss Vianna. Estréiou no Teatro do SESC Vila Mariana em março de 2009. ‘The Strongest Animal in the World’ is the 7th performance devised by Ângelo Madureira and Ana Catarina Vieira, and the second part of the trilogy which initiated in 2008 with ‘The Scientific Name of the Ant’. Each performance has its own characteristics, but the language research method remains the same. The creative process behind the trilogy derives from the compilation of 1800 photos of their previous performances. Images of ‘Soundsitive’ (2003), ‘Other Forms’ (2004), ‘How?’ (2005) and ‘Clandestine’ (2006) were reworked into the new performance in a recycled collage. 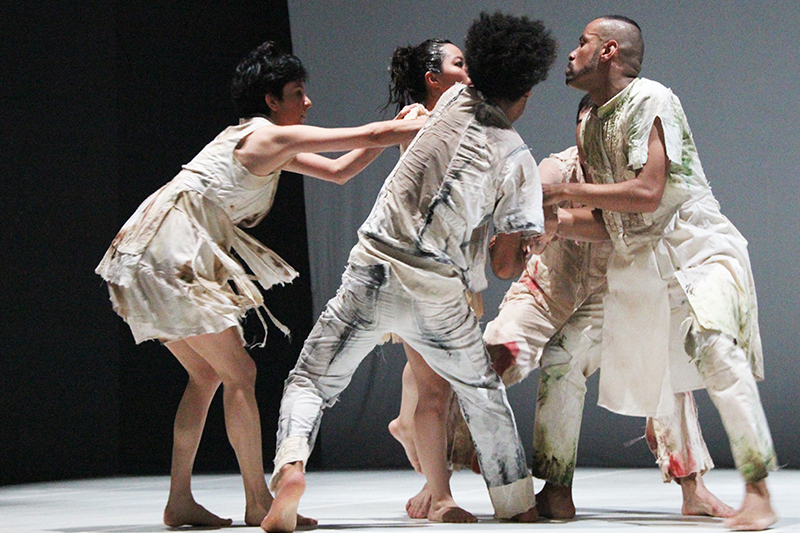 ‘The Strongest Animal in the World’ deepened the exploratory research of their previous performances through the investigation of the volumes contained by each movement, and it became indispensible to work with a bigger cast. Ângelo and Ana Catarina also attempted to bring to the fore those elements of popular dance which are central to their language research. There is an intentional ‘hide and seek’ play with popular culture throughout the performance, in the soundtrack, the choreography and the wardrobe. ‘The Strongest Animal in the World’ questions the place of the strength of survival and of the strong characters in a group. The direction is once again by Fernando Faro – creator and director of renowned television programmes for TV Cultura such as ‘MPB Especial’ and ‘Ensaio’, and who has worked with renowned musicians such as Paulinho da Viola, Vinícius and Toquinho, Chico Buarque, Milton Nascimento, Elis Regina, Martinho da Vila and João Gilberto, among others. ‘The casting process for the performance was a meticulous one, since working with the mixture of cultures, dance backgrounds and ethnic origins was our priority’, explain Ângelo and Ana Catarina. ‘And we also felt this was the right moment to test the language we’ve been developing in other bodies’, they add. With these aims in mind, the cast was composed by Ana Noronha, Luiz Anastácio, Carolina Coelho and Eduardo Fukushima. 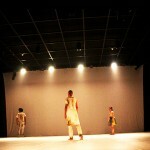 Juliana Augusta Vieira collaborated with the light design and wardrobe, continuing her research on light design for dance performances. The wardrobe was devised during the performance rehearsals. The white of the clothes worn in the first part of the trilogy, ‘The Scientific Name of the Ant’, became worn out, transformed by the passage of time and by the nature of the lived situations. 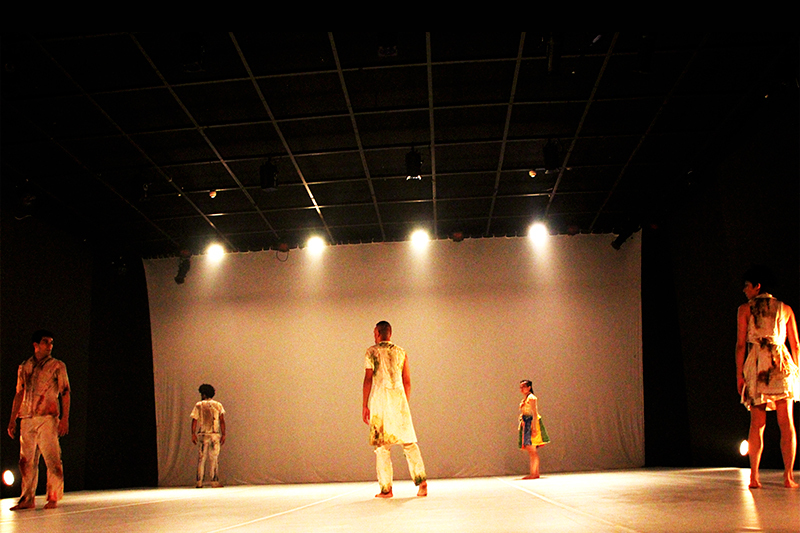 This performance had the support of the Dance Foment Programme of the City of São Paulo, SESC São Paulo, DEC, Televisão Cultura, Crisantempo/Gisela Moreau, Galeria Olido, Cooperativa Paulista de Teatro and Espaço Ângelo Madureira and Ana Catarina Vieira.